Traveling in March, when Antarctica whale activity is traditionally at its peak, spend 5 days exploring the Peninsula alongside guest cetacean researchers on this special marine mammal focused voyage. As autumn begins to close in, explore the Peninsula’s key sites aboard an expeditionary ship with under 100 passengers. Sailing south towards Antarctica we will be joined by hundreds of seabirds including the wandering albatross. Giant petrels and smaller Cape petrels are also constant companions as we transit the Drake Passage. Photographing these magnificent birds from the deck of the ship takes patience and skill and our photography expert will be on hand to show you the best techniques. Join the ship's Captain on the bridge and learn about the operations of our modern research vessel. Throughout the day, our onboard experts educate us with a series of presentations about the environment, wildlife and history and the locations we hope to visit in the coming days. 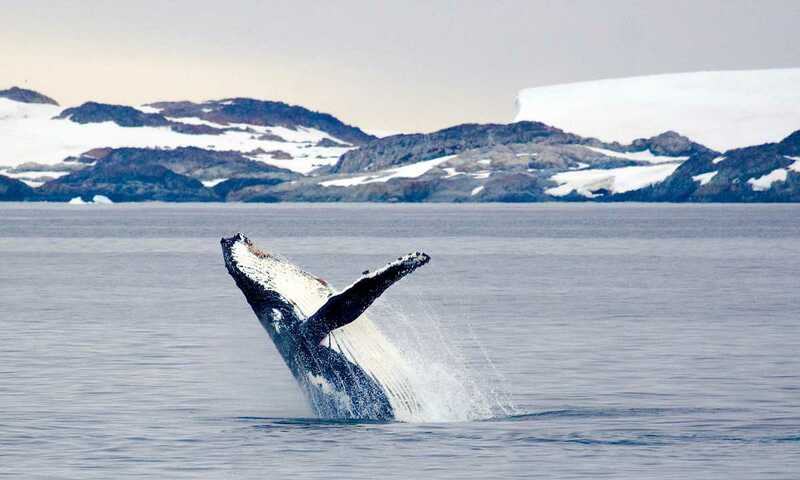 As we approach the coastline of Antarctica, whale sightings increase significantly. We awaken today and the magnificent snowy peaks of continental Antarctica are laid out before us. 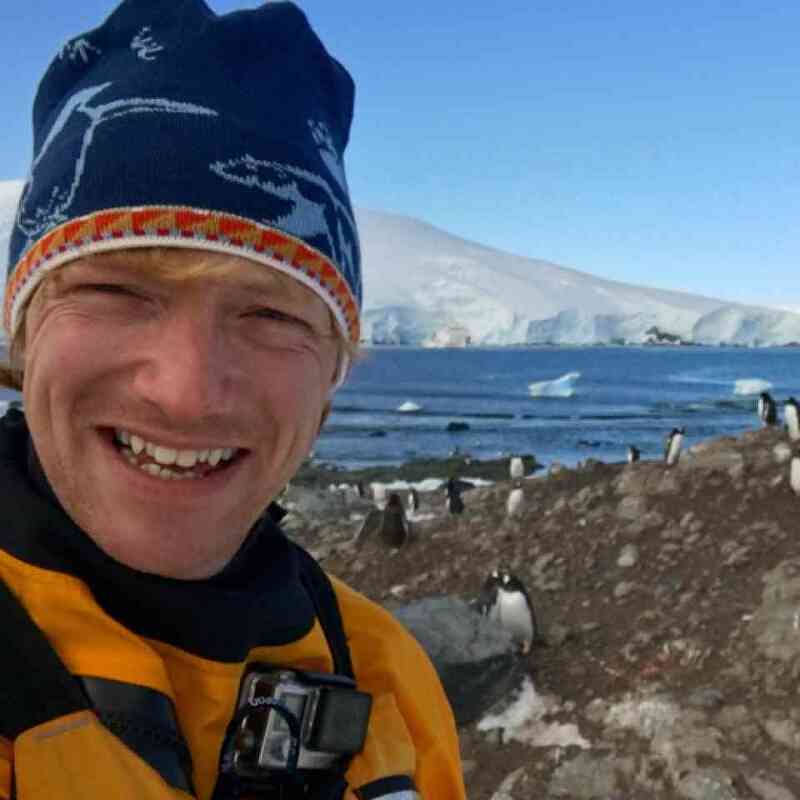 Even our experienced expedition staff, some with more than 100 journeys south, will take a moment to pause and reflect on the immense power of Antarctica. 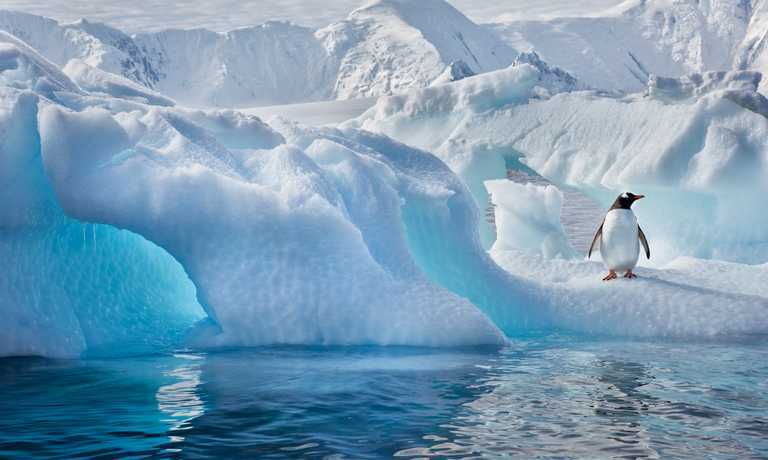 Take a deep breath - you have arrived.The waterways of the Antarctic Peninsula are home to deep bays, pristine coves and inlets and numerous islands. The landscape features heavily glaciated mountains permanently covered in ice and snow. Rocky outcrops, known as "nunataks" are home to Gentoo, Adelie and Chinstrap penguin rookeries and the waters are rich in marine life. We frequently encounter seals, including the powerful leopard seal, often found relaxing on an ice floe. Curious humpback whales and the smaller minke whales are found in sizeable numbers in this region. Sightings of orca are not uncommon.Fournier Bay is a known whale "hot-spot" and ice permitting, we explore in zodiacs hoping to encounter pods of whales. The science team hopes to deploy non-invasive tracking devices on the whales to collect data on dive and feeding patterns. Observation and photography of whale flukes (tails) are activities everyone is encouraged to participate in both from the ship and while Zodiac cruising. Whale flukes are unique identifiers of particular animals, in much the same way as a human fingerprint. Collecting and analyzing this data is vital to our understanding of whale migration patterns and social behaviour. In addition to our whale encounters, we enjoy a regular program of exploration on and off the ship. Popular activities include guided hikes on shore and visits to wildlife colonies with our expert naturalist guides while the historic huts and science stations provide a fascinating glimpse into the past and the present. 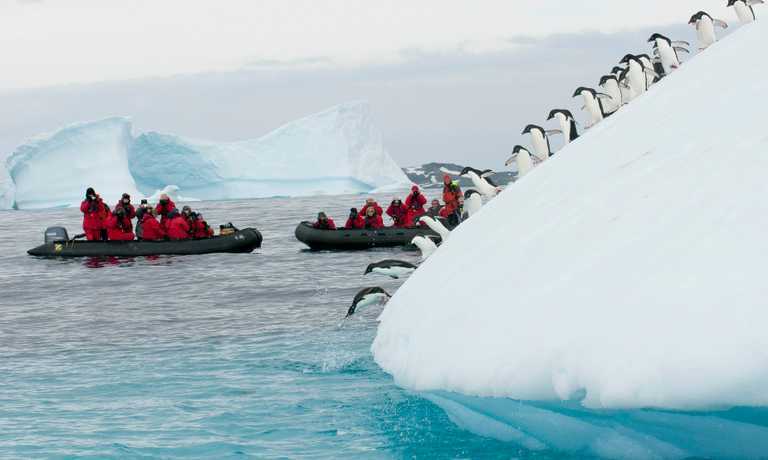 Zodiac cruising among the ice is a memorable activity and our sea kayakers may range several miles from the ship. Our photography guide will be on hand to help you with your camera handling, image composition and the peculiar light found in Antarctica. 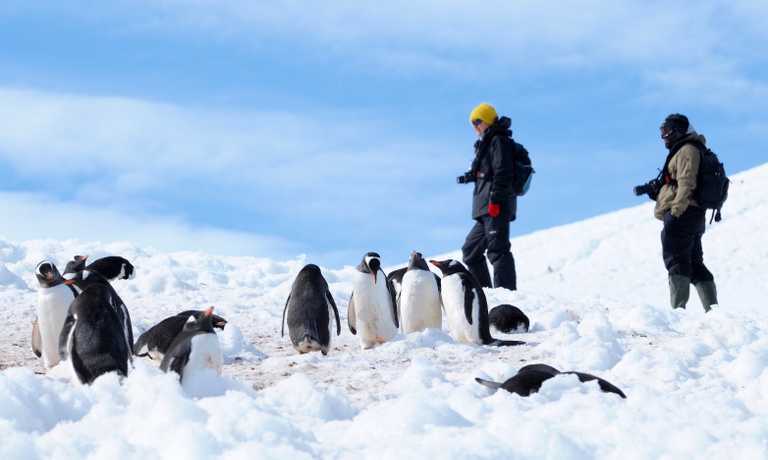 Planned excursions could include Cierva Cove, Danco Island, or a cruise through the Errera Channel to visit the penguin rookeries at Cuverville Island. Wilhelmina Bay never disappoints and is another important location where the scientists hope to deploy their research tools. Neko Harbour is yet another highlight and offers an excellent hiking route providing stunning 360-degree views. After several busy days of exploration along the Peninsula, we head north across the Bransfield Strait, bound for the South Shetland Islands. This is an important whale migration corridor and frequent sightings can be expected of humpbacks and even the fast moving orca. The adventure is not over and, if the weather conditions allow, we sail the ship into the flooded volcanic caldera at Deception Island. This is a very dramatic location. History is all around us as we explore the old whaling station, with the rusted old boilers, aircraft hangar and dilapidated wooden structures. There are several other nearby landing sites to tempt us including Half Moon Island, or the broad pebbly beach at Yankee Harbour, where we often encounter Weddell seals sunning themselves. This is a great spot for a hike or a zodiac cruise. In the evening, we navigate north through the McFarlane Strait and into the Drake Passage, charting a course for South America. As we make our way back to Ushuaia, the educational presentations continue and we enjoy an entertaining and memorable voyage recap by our Expedition Leader. Join our photography experts in the multimedia room and download and backup your precious images. If weather conditions allow, we hope to make a rounding of Cape Horn. This fabled stretch of water is home to legendary tales of exploration and early navigation. It's a fitting place to reflect on a wonderful expedition. Approaching the entrance to the Beagle Channel in early evening light, we enjoy a special dinner attended by the Captain of the ship. In the early morning, we arrive into Ushuaia, Argentina. It is time to say farewell to your crew and fellow travellers. Guests will be transported to their hotels or to the airport for return flights home. It will be possible to connect to flights through to Buenos Aires or other destinations in South America. Otherwise, enjoy a night in town or venture further afield to explore the highlights of Patagonia. Built as solid as a tank, you can feel this ship’s superior stability as soon as you embark. For those travelling solo and want their own cabin, the single supplement is 1.5 to 2 times the cost of a single berth, please contact us for details. However, there is no single supplement for passengers willing to share a cabin.